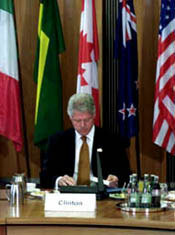 At the German Chancellery in Berlin, President Clinton reviews his notes before the opening session of the Progressive Governance Conference. 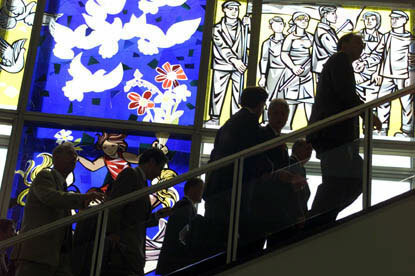 After the morning sessions, the world leaders move to the Chancellery's Banquet hall for Closing Statements. The President makes remakes during the Progressive Governance Conference. 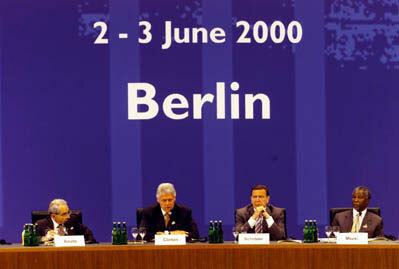 Also pictured left to right: left is Italian Prime Minister Giuliano Amato, German Chancellor Schroeder, and South African President Mbeki. 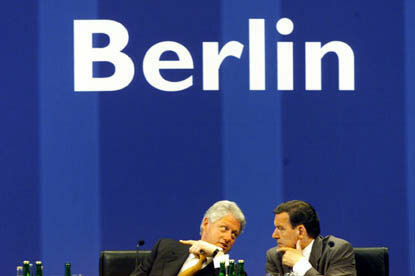 The President makes a comment to Chancellor Schroeder during the conference. 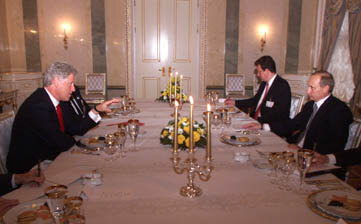 After his evening arrival in Moscow, President Clinton has dinner with Russian President Vladimir Putin at the Kremlin.